Our least expensive model starts at under $2300. Does not include installation. Do I keep all of the surcharge money collected? You keep every penny. We return the vault cash taken out every 48 hours into your bank account. We send you the surcharge money monthly. Who provides the money for the ATM? You provide the money for your own ATM. This is called the vault cash. How much vault cash should I put into the ATM? How much are monthly fees for processing? When you run reports from the ATM that must connect and send data to the processing center, there is a small cost. Usually $2 or $3 monthly. We now have a $10 monthly network access fee that covers all aspects of processing and support. This also covers the cost of online reporting in which we give you access to live reporting online. See what your ATM is doing at home! What is the warranty on an automated teller machine? Most automated teller machines have a 1 year warranty and 90 days labor. What happens when the ATM runs out of receipt paper? Always check so that will not occur. The first roll of ATM paper comes with the automated teller machine you purchased. We also send you an extra roll within the first week or two so that you have a backup ready to go. When you install this second roll of paper call us or call our paper supplier directly and purchase additional rolls at our cost. Do the ATM’s need programmed so that they will work? Yes, automated teller machines need to be programmed with terminal ID information, Master Keys, and other processing network programming including the receipt printout. Some ATM cash machines are programmed at the factory, some require a technician to come and program the ATM on location. Only one ATM manufacturer offers an extended warranty program. After the 12th month of ownership, ATM owners can elect to sign up for an extended warranty program with a Nautilus Hyosung ATM. You can extend the warranty a maximum of four times. How much is shipping? Is shipping available to every state in the USA? Yes we can get ATM’s delivered to every state in the US. At the beginning of 2005 we sold one in Hawaii and a week later sold one in Alaska. Since then, we have sold several in Hawaii and Alaska. Shipping can be from $100 up to $300 depending on how remote your location is. Average price for shipping is $195. Some shipping is free. How do I get service for my ATM? What if my ATM breaks? Service is available nationwide through a large network of ATM techs. In reality, ATM’s of today hardly ever break down. If they do, the same tech that installs your machine will be available to fix your machine in most cases. However, today’s ATM is designed to be service friendly. In most cases a part can be simply unscrewed and unplugged then replaced very easily. The ATM owner should be able to make most repairs themselves, therefore saving service call fees. What if I don’t want to buy an ATM but need one in my business? Will someone put one in my business? We have plans for locations that qualify. 1. We can install an ATM and have it refilled by a vault cash service. 2. We can install a machine and you can refill the machine with your own money. We split the surcharge 50/50. 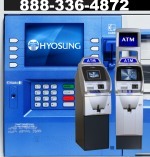 Call us and ask about ATM placement services. What if I already have a processor? Can I buy an ATM and have it processed by another company? Our machines are priced low for a reason. We price them near wholesale and recoup any profit from ATM networks over time. For it to be profitable for us, since we are a business, it takes two or three years of processing your ATM. Our processing services are designed to work in the background with no problems. You get the absolute best service and network support available today. We are confident that you will be more than satisfied with our service. For ATM’s we sell and do not process, add $395. Can ATM’s conduct check cashing operations? Do ATM cash machines dispense any thing else besides money? Some Automated Teller Machines can dispense movie tickets, coupons, pre paid phone cards, and more. These services are add-ons from third party providers and can be a little difficult to get operating properly. We sell and lease ATM’s but we do not offer the same support for other people’s products. They have their own support staff for these types of programs. Can a foreign credit card be used in the ATM? Foreign cards work in our ATM’s, however foreign credit cards cannot be surcharged.
. If a foreign credit card is used in your automated teller machine you will not receive your normal $1.50 or $2.00 surcharge for that transaction. These cards are considered surcharge free. What is the maximum amount of money somebody can take out? Can a limit be set at $100? What happens if a customer claims the ATM did not dispense money, but they had a receipt from the machine. Is there a way to see if the machine dispensed any money? First, look at the receipt. Make sure it looks like a withdrawal and not an account balance slip. The best thing to do is wait for 24 hours for the funds to be added or deducted from their account. You don’t want to give out $100 if the $100 was never debited out of your customer’s checking account so don’t give money back on the spot. You will also need print out the electronic journal. This is a printed journal of all the transactions, and a record of all bills dispensed. The electronic journal printout is your best defense against potential disputes. What if I need an outdoor cash machine for a location? Do you sell to banks? Visit OutdoorATM.com for bank ATM manufacturers, outdoor, weatherproof and weather resistant.